Speaking to Newsweek on condition of anonymity, a senior figure in one of Europe’s largest Jewish organisations has revealed that their group has been approached in the past year by MEPs, including members of the Austrian Freedom Party, seeking to create a coalition to combat the rise of Islam in Europe. They emphasized that all approaches had been flatly refused. Now the source says that far-Right’s rapprochement with Jewish groups is far from new as politicians from various parties have attempted to court their group, offering to “be friends with Jews” if Jewish groups “help us in our fight against Muslims”. The bloc includes the Austrian Freedom Party, whose current leader Heinz-Christian Strache was criticised for posting a cartoon perceived as anti-Semitic on his Facebook page. The party’s former leader, Jörg Haider, who died in a car crash in 2008, previously described the Nazi concentration camps as “penal camps” and referred to SS officers as “upstanding men of character”. The European Jewish Association, which claims to be the biggest federation of Jewish organisations in Europe, said that the EJP risked “magnifying the problem” of anti-Semitism by “giving a platform to those seeking to spread messages of hate”. In a statement on the EJP’s website, Rabinovich said he was “very surprised” by the negative reaction from other Jewish groups. “The meeting with the [Europe of Nations and Freedom] opens the new dialogue, which, in our firm conviction is what Europe needs today – a dialogue of everybody with everyone, in order to preserve peace and tolerance and combat anti-Semitism in Europe,” said Rabinovich. 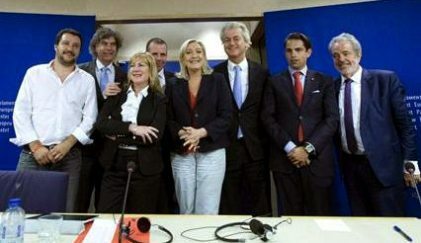 He added that a joint statement with Le Pen had condemned anti-Semitism as “the cancer of Europe”.